Theresa joined our team of Radiologic Technologists at Emergency One in 2016. She brings a host of experience to us, having spent time as a clinical instructor for SUNY Orange Radiologic Technology program and in sales and marketing of radiology products. After graduating with honors from SUNY Orange in Radiologic Technology, she continued on to receive her BS in Healthcare Management from Breyer State University. Theresa is a registered technologist licensed nationally by the ARRT and by New York State with the NYSRT and an active member of the American Society of Radiologic Technologists. 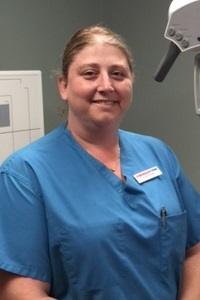 In addition to providing X-Ray services, Theresa is a key part of our Occupational Medicine program, where she is certified as a Breath Alcohol Technician and DOT Drug Screen Technician. In addition, she conducts Fit Tests, Audiometric Testing and Pulmonary Function Testing associated with our Occupational Health Center. In her spare time, Theresa embraces the opportunity to enjoy activities with her daughter and husband.